from 3 pcs. 6.20 CHF ea. from 10 pcs. 5.65 CHF ea. from 20 pcs. 5.35 CHF ea. from 40 pcs. 5.10 CHF ea. The grip is made out of a piece of aluminium and a 12 x 6 mm magnetic disc has been inserted. This magnet is produced especially for us in a small workshop in Switzerland and is of the finest Swiss quality. 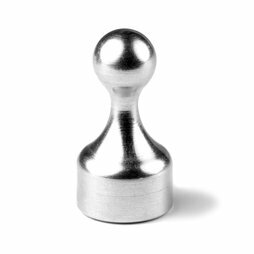 The magnet has an adhesive force of nearly 4 kg, is elegant, exclusive and comfortable to hold - precisely the right thing for the boss who does not wish to ruin the look of his or her designer office with tacky plastic magnets. Thanks to the enormous adhesive force of these magnets, even thick business reports can be hung on a metal wall and up to 20 A4 sheets can be attached to a whiteboard. 5 pcs. 1.99 CHF ea. The grip is made of aluminium. A disc magnet S-12-06-N has been pressed into the base. Respectable adhesive force for the boss. The small boss magnet holds up even thicker postcards on magnetic glass boards.